They're Closer Than You Think. Many fans are getting excited to see The Muppets movie when it finally returns to the big screen this fall, but Disney hasn't officially started up any direct marketing yet. However, Ain't It Cool News posted a photo snapped of the first official teaser poster we've seen for The Muppets that was apparently found on display at a theater in Montreal. It shows Kermit and Miss Piggy and even Fozzie Bear and Gonzo. I'm not sure why some are calling this so strange, as I think it just looks like a fun twist on normal Hollywood posters but with the Muppets. 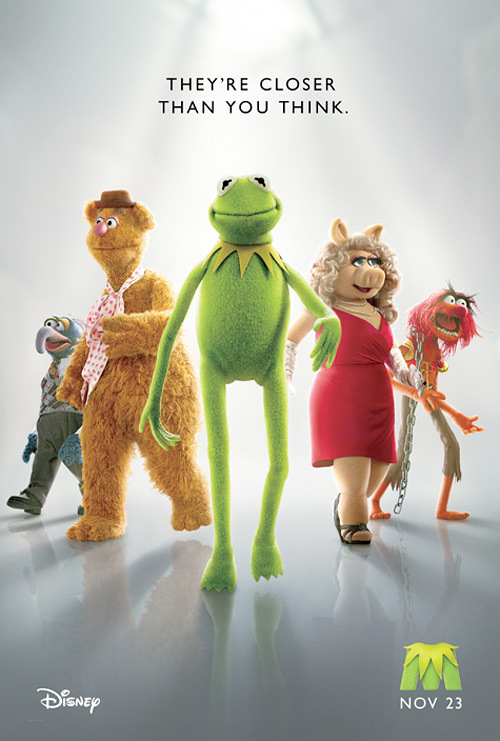 Check out the low res photo of The Muppets poster below. Update: We've added the full high res version of the poster, as it was just officially debuted on Fandango. James Bobin ("Flight of the Conchords") is at the helm of this new Muppets movie, which follows Walter & Gary (Jaon Segel), two die-hard Muppet fans and roommates who must save Muppet Theater by reuniting Kermit, Piggy, and the entire troupe to stage an "old-fashioned extravaganza." The cast is full of all kinds of celebrity cameos and other great random appearances, including Amy Adams, Chris Cooper, Rashida Jones, Zach Galifianakis, Ricky Gervais, Alan Arkin and Billy Crystal. Shooting is already finished, and Disney will be bringing The Muppets to theaters starting on November 23rd later this fall. Stay tuned for the trailer! Fantastic! I always loved seeing Kermit's full body when he walked around, or rode a bike, or whatever else frogs do. Yea I guess that's why it's weird, but still... It's these characters that are beloved. wow, they've hardly aged at all. THE MUPPETS ARE BACK OMMMMGG MY CHILD HOOD JUST HIT ME IN THE FACE! What's nice for the creators is that they can't ruin the muppets anymore than Disney already has with their crappy TV movies. This poster freaked me out a little. I couldn't work out why. Then I realised - it's the legs. They're just wrong. They look like lifeless, artificial things stitched onto beloved 50-years-strong personalities. If you cover the bottom of the poster, it starts to make sense again. They do not look lifeless. You are just not used to seeing Muppets in full-body shots. I think this is a glimpse of what everyones complaining about. I think we're gonna get a lot of full-frame and true human interaction with the Muppets in this movie. And I'm OK with that. This will be a lot of fun, hopefully hitting all the right notes, and lower limbs aren't going to take anything away from it. I just hope they nail this and not make it a silly 'kids' movie' like the ones made after the Muppet Caper. If you watch the old show, it was them doing and saying funny things as puppets, not BECAUSE they were puppets.